GreenPointe Communities is proud to welcome MasterCraft Builder Group to its family of award-winning home builders in TrailMark. MasterCraft will soon break ground on a new model home, which is anticipated to open in late 2017. At TrailMark, MasterCraft Builder Group is offering six one- and two-story floor plans ranging in size from 2,987 square feet to 4,071 square feet. MasterCraft Builder Group homes at TrailMark are priced from the high $300,000s. 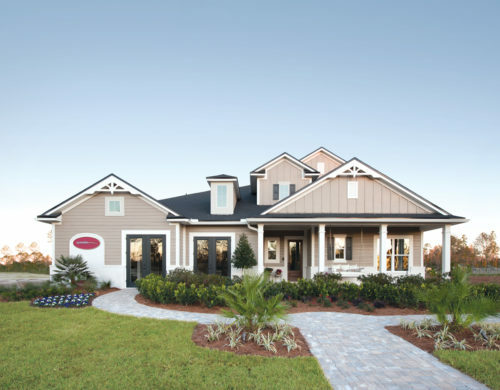 MasterCraft Builder Group was honored as the 2012 Builder of the Year by the Northeast Florida Builders Association, and has received numerous awards in the Parade of Homes. For more information, visit www.MastercraftBuilderGroup.com. TrailMark’s builder team, which also includes D.R. Horton, David Weekley Homes, Landon Homes and Providence Homes, offers a wide range of styles, floor plans and natural settings. Homes range in size from approximately 1,500 square feet to more than 3,900 square feet and are priced from the mid $200,000s. The community currently has four beautifully decorated model homes available to tour and several move-in ready showcase homes under construction. Homes are priced from the $200,000s. Located in Northeast Florida’s fastest growing area, TrailMark is a special place to call home. The community is close to everything St. Johns County has to offer, making it possible for residents to connect with nature and their neighborhood. With green vistas and natural oak hammocks, TrailMark has miles of trails and winding waterways with access to Six Mile Creek for kayak and canoe adventures. With opportunities to live life connected with the outdoors, TrailMark appeals to homebuyers seeking a healthier lifestyle with access to a wide range of recreational amenities. Homeowners come to the Amenity Center to lounge by the resort-style, beach entry pool overlooking the lake. A fitness center, sports courts and playing fields makes it easy to stay in shape. The Camp House provides a perfect setting to celebrate and socialize with friends and neighbors. TrailMark’s Lifestyle Director plans activities and social gatherings to help foster neighborhood relationships. TrailMark is located within the highly rated St. Johns County School District and the new Picolata Crossing Elementary school will open adjacent to the community in August 2017. While off the beaten path, TrailMark’s proximity to Interstate 95, Jacksonville and St. Augustine makes it easy to access entertainment, shopping, dining, employment centers and more. TrailMark is located at 805 TrailMark Drive in St. Augustine. To visit TrailMark from Interstate 95, take exit #323/International Golf Parkway southwest towards World Golf Village and travel approximately 2.2 miles. Continue past the intersection at State Road 16 (where International Golf Parkway becomes Pacetti Road) and proceed approximately 2.6 miles to TrailMark on the right. For more information, visit www.TrailMarkLiving.com.